Mmm I do love this recipe too and your photos is one of the best I've seen for this recipe! I'm jealous of your ability to get such fresh (and cheap) produce every day. What a dream! This looks fantastic! I was looking for another meal to add to my menu for this week and this is perfect–can’t wait to try it! Looks delicious!! I'm glad you liked it. 🙂 I'm honestly shocked at the fresh produce you can get in China. Don't know why I thought it would be harder to come by. Well, there are certain things that are harder to find, or that go by a different name so using my iphone translator can be no help at all. 🙂 But really, the Chinese love their vegetables and demand that they're fresh! 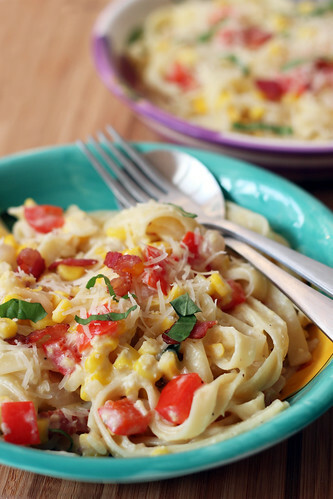 This is one of my most favorite pasta recipes, your version looks fantastic. 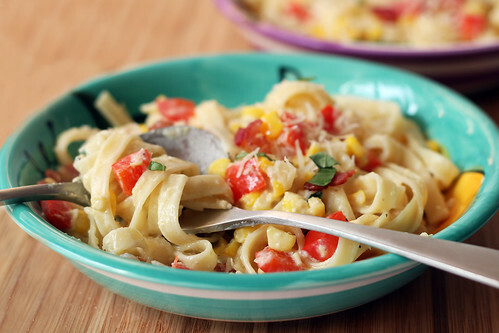 I rarely put corn in pasta dishes but it sounds great especially with a creamy sauce. Oddly enough most of my life a was a very, very firm believer in “corn is not an ingredient.” Recently something changed and now I realize how very wrong I was. The sweet, crunchy pops are awesome with the creamy sauce! I've been pleasantly surprised with how much I can find here. If anything, it will actually be even easier in Shanghai since there is an even bigger expat community!